Falcon Containers officially moved its headquarters to a new site just East of Austin. The new 51 acre facility, as shown below, will house Falcon’s conex-based offices, a new fabrication/ manufacturing facility, and the majority of its rental & sales inventory. The site, now coined “Area 51”, will facilitate Falcon’s growing operations as well as expansion capability, new product development and testing. 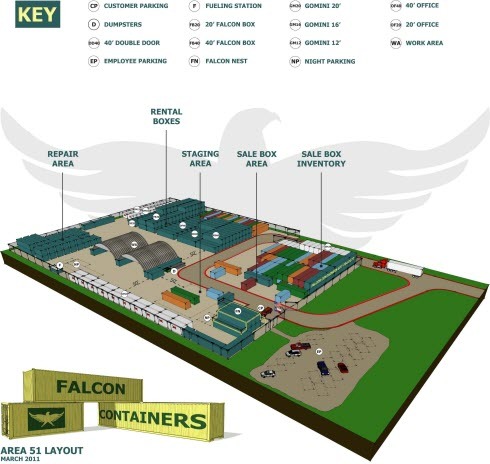 The name given to the new location by Falcon employees appears fitting, not only due to its geographical size of 51 acres, but, also coincides well with the name given to the airspace above the true Area 51 in Nevada by military pilots: "The Box" or "The Container”. On the site, Falcon is building Central Texas' first fully mobile container-based structure for its headquarters (rendering below). 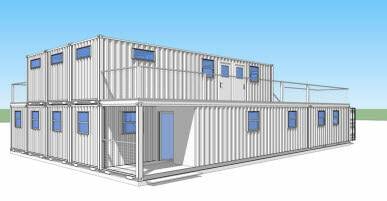 This 2,500 square foot mobile building will be assembled from eight repurposed 40' shipping containers with five on the first floor and three on the second floor. The interiors will have "clear span" areas that give dimensions greater than the standard 8' width of a container, but at the same time will maintain the industrial look and feel of the container. Future plans for “Area 51” include a demo area for shipping container cabins, showcase for military training solutions, and other new products that "think inside the box". Area 51 is located at 7717 Gilbert Road, Manor Texas at the intersection of Texas State Highway 130 (SH130) and FM 973. The facility is less than 8 miles north of Austin-Bergstrom International Airport (approximately 10 minutes by car) making it easily accessible for visitors. To schedule a visit, please email tours@falconcontainers.com. For more information, please contact Grace Boykin at (512) 231-9603 or email us at gboykin@falconcontainers.com.